A peek through the lowered rollgate revealed a narrow table of twenty that was nestled in between the towering wine shelves and the purposely dark hum of a refrigerator bank. Through the steel and glass you could hear only muffled conversation, the clang of plates and the reverberation of laughter as it filled the converted shop and snuck out the cracks in the front windows. 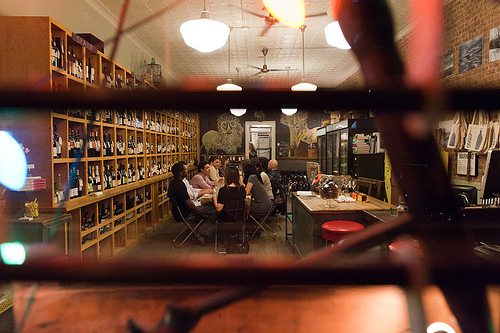 Last Saturday 20 lucky singles mingled it up after hours in a little Greenpoint wine shop to sip some vino, taste some edibles and meet their possible spring fling. I’d say the evening was a fantastic success being that our guests made a connection with more than the food. 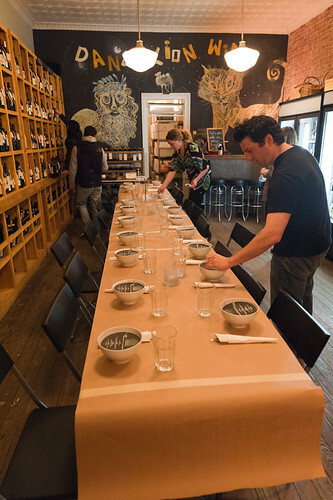 To pull this supper off we partnered up with Dandelion Wines to provide the space and wines that complimented our four course feast. We then summoned some singles who were up for a gastro-guzzle-blind date. The idea came from my realization that daylight savings time forces us to lose an hour each year as we hurdle ourselves into the future. This imposed, careless disregard in hopes of getting closer to the impending spring is a cheap trick that strips us of the commodity that seems most scarce these days, time. I thought it might be smart, and fun, to hold onto those 60 minutes and see what happens if you anonymously were put into a room with nineteen strangers. Below is the glutenous mystery that unfolded. As the final customers picked and purchased their Sunday night, night caps, we were busy finalizing the table settings of our conversion from wine shop to true pop-up restaurant. With every detail triple checked the menus were set and we fired up the small stove in the back of the shop to get the make shift kitchen into high gear. While Aimee browned the polenta and I started building the first plate of chicken cacciatore our guests snacked on some cheese and dried sausage while sipping Dandelion’s first selection a “La Gaudrelle” Cremant de Loire Sparkling Chenin Blanc. Soon enough our first course was ready to be passed. 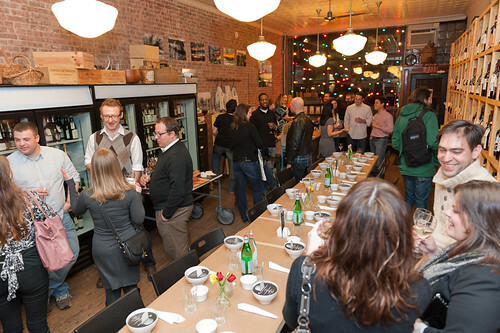 We like to keep our guests standing for a bit so they can easily move around the room and meet others. 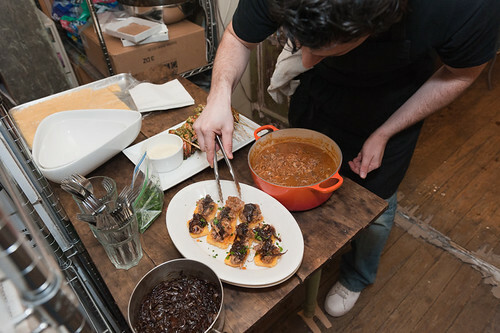 The food worked it’s magic as each plate simultaneously became an interruption and a catalyst . 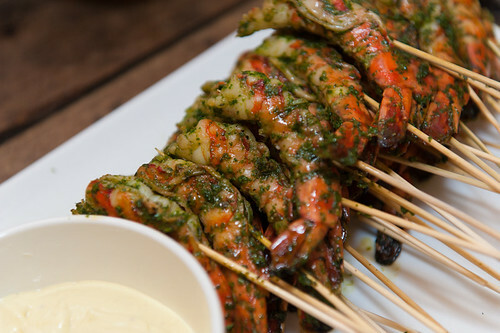 Chilled jumbo prawns with arugula pesto and a lemon aioli. 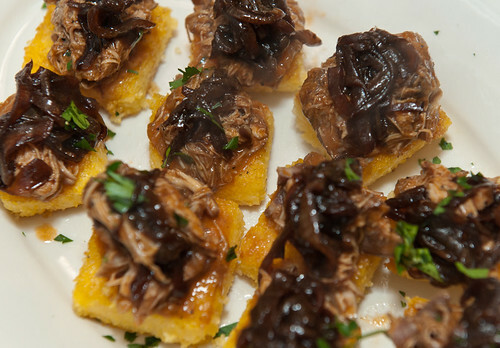 Braised chicken cacciatore on fresh polenta with caramelized balsamic onions. 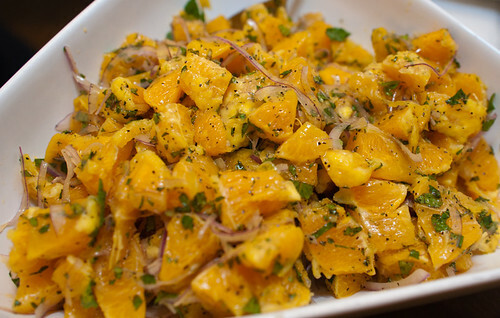 This Sicilian orange salad was our first seated course. A bit early for the season, this simplest of salads is one of my all time favorites. I chose it for its ability to clean the palette and lighten the stomach after the heavier chicken and polenta appetizer. I was first introduced to this salad during a stay at Sebastiano’s farm in Pattenio, Sicily. His wife pulled together a rustic meal for us with only what was grown on the grounds of the old olive farm. The crude preparation added to the dishes character and I quietly took note of the ingredients. Along with the salad Lily and Meg, of Dandelion, chose a 2009 “Versi Bianco” Grecanico/Inzolia Blend from Sicily and a 2009 Manciat “Franclieu” Chardonnay from Macon Charnay to mix sensationally with the citrus and mint of the salad. Just as the citrus began to dissipate from our guests palate we returned to the table with the main course. A dish that I have reserved for a long while with these suppers. 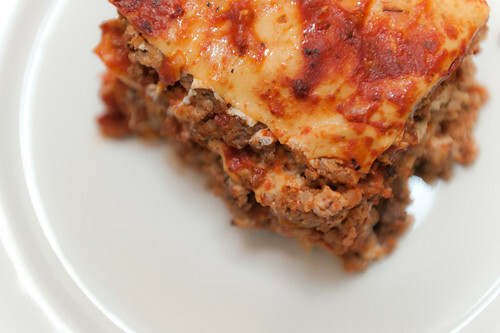 I could ramble here for 1000 words about how I like my lasagna. Let’s just say I make it dense and dry. No extra sauce. No molten explosion of mozzarella. If you make it right what you put in the pan the first time is all you need. To accompany my speciality we paired it with a roasted cauliflower salad containing another sicilian twist, chick peas. 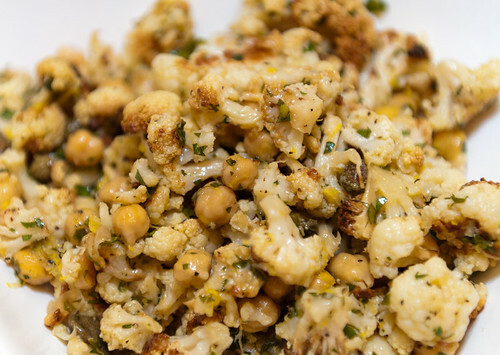 Roasted cauliflower with capers and chick peas. 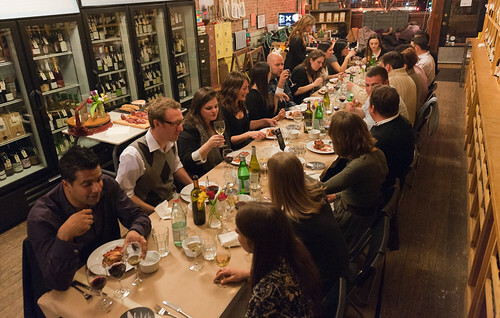 As the table finished their entrees they sipped their perfectly paired 2008 Marabino “Noto” Nero d’Avola and 2007 Wolffer Cabernet Franc from Long Island falling deeper into the collective conversation that the table had now fostered. We always complete our suppers with a confection by Aimee and a home spun ice cream by myself to make up our final course. This time we added an additional twist by pairing these two items together. 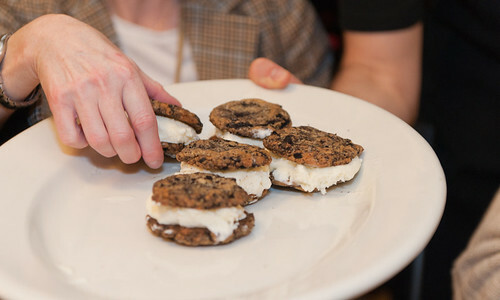 The result were these Oreo cookie cookie mascarpone ice cream sandwiches. Yes. That is not a typo. 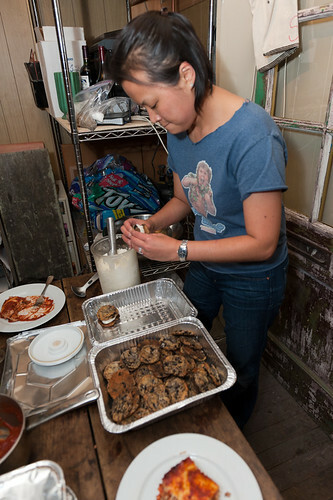 Aimee’s home made Oreo cookie cookie’s which are like chocolate chip cookie dough with the chocolate chips substituted for crushed Oreos are decadent on their own. 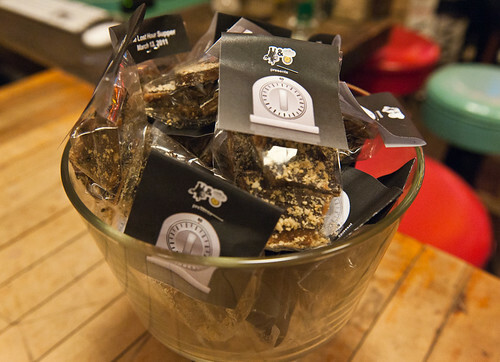 Mix that with a double batch of marscapone ice cream and you have a chipwich like no other. But we didn’t stop there. Paired with this sugary sandwich was an Alcyone Tannat from Uruguay. This baby was made from all grapes but you could taste a full bodied chocolate and hints of vanilla in every sip. Eventually it was time for us to reverse the shops metamorphosis and send our wonderful guests back onto the streets of Brooklyn. Of course we could not send them out there empty handed. To help in this transition we carefully packaged a bit of home made salted caramel in pairs with the hopes of it being consumed by two newly connected individuals. As our last guest left and the lights in the shop were dimmed down, we wondered how many of our new friends might have found companionship for the evening, the spring or possibly for the rest of their life. Let’s be clear, our goal for the evening was not nearly so lofty but to let you in on a little secret, this supper club has spawned at least one marriage. Mine. As always, we could never pull off something like this without the help of our amazing crew. We are gearing up for the new season of dinners on the deck so make sure you are on the list below. We hope to see you at the table really soon. A few recipies are listed below to keep you busy until the next supper. If you think the lasagna recipe is in there you’re crazy but if you really crave it I might give up a secret or two. But, only if you ask. 1. Coat cauliflower lightly with olive oil. 2. Roast cauliflower in Baking dish for an hour at 400 degrees.